2019 Dinner & a Movie Series Kick Off! ICPJ’s Latin America Task Force is excited to kick off its 2019 Dinner & a Movie Series tonight with the documentary Lourdes! The series gives attendees the chance to engage with compelling social justice issues relating to Latin America while enjoying a delicious meal and good company. The events will be held one select Tuesday each month from January to May at St. Mary Student Parish at 331 Thompson St. Dinner will be held at 6:30pm and the film will start at 7:00pm. 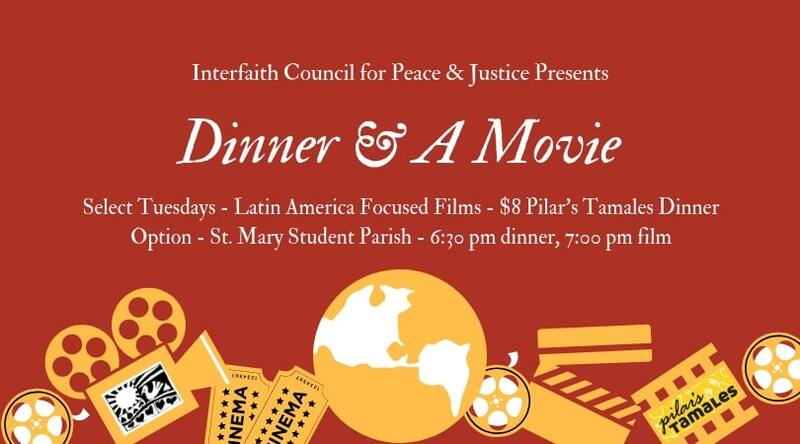 The dinner option is $8 and will include one tamale with sides from Pilar’s Tamales; the film is free! Please RSVP by noon the day of the event to reserve your meal! After sixteen years as the Director of ICPJ, I am excited to welcome the ICPJ’s new Co-Directors, Desiraé Simmons and Eleanore Ablan-Owen, who have just started this week with ICPJ! They are delighted to join ICPJ and build upon our rich history of social justice education and organizing. They look forward to learning more about your hopes for the organization as we work to address the issues that matter. Eleanore and Desiraé bring a wealth of experience and energy to the organization and I feel confident that ICPJ will thrive with their service. Desiraé ([email protected]) lives in Ypsilanti with her husband Zander and almost 2-year-old daughter Indigo. She is originally from Chicago and Cleveland and moved to Michigan 4 years ago from Boston. 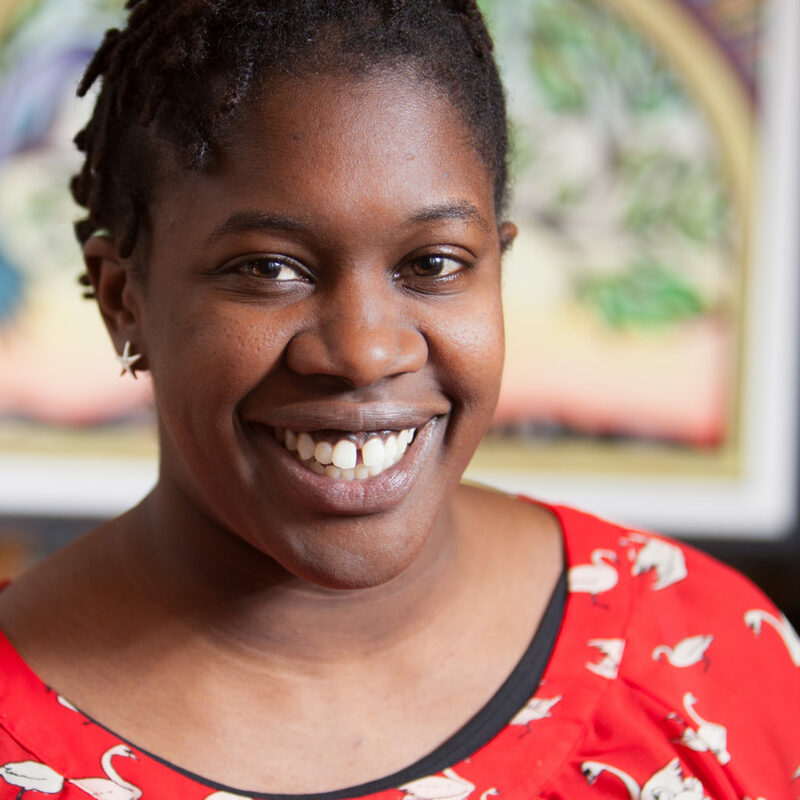 Her previous professional experience is in experiential and community-based learning where she designed curriculum, created and facilitated workshops around systemic discrimination and reflective practice, and built relationships across difference. 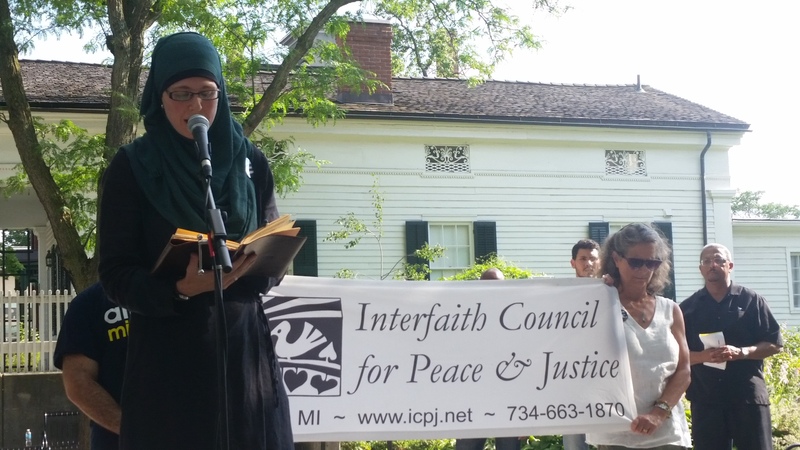 Since being in Ypsilanti, she co-hosted a resistance march focused on the love, resilience, and history of activism in the community; organized for affordable housing, keeping a school within the Ypsilanti Community School district, and a Community Benefits Ordinance; ran for City Council as a nonpartisan candidate; and she currently holds leadership positions within the Washtenaw County Democratic Party and serves on a citizen committee for housing affordability and accessibility. Eleanore ([email protected]) has been living and working in Detroit since 2000. With a background in community development she has served numerous nonprofits and resident groups to build community self-determination. She has focused on projects that emphasize community ownership of land, community wealth-building, and democratic decision-making regarding land use and neighborhood planning. As an activist and during her time as staff at the National Lawyers Guild, Eleanore has worked on a variety of issues – from prisoners’ rights, anti-militarism, police accountability, and worker rights, to environmental justice. As an undergrad at UM, she was greatly influenced by the work of ICPJ and the AFSC. The seeds planted by ICPJ reach far and wide – she is excited to be back working in Washtenaw County’s social justice community! In her downtime, Eleanore organizes tree plantings, builds community gardens, loves to hike, and has been known to ride around with her two sons on their “bike train” made up of two tagalongs attached to the back of her bike. As Desiraé and Eleanore take the lead, I feel confident that they will be amazing leaders for the organization’s next chapter. I’ll be around for the next few weeks, and will complete my transition by the end of February. We will schedule a welcome gathering for Desiraé and Eleanore and a farewell gathering for me–stay tuned! The 2018 ICPJ Winter Newsletter is available for download. 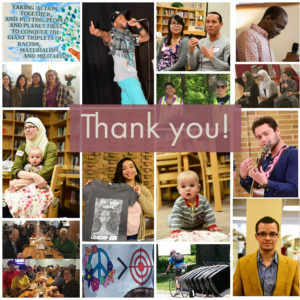 Check it out for a report back from the 2018 Facing Race Conference, updates on Congregational Sanctuary and human rights organizing for immigrant youth, and much more. 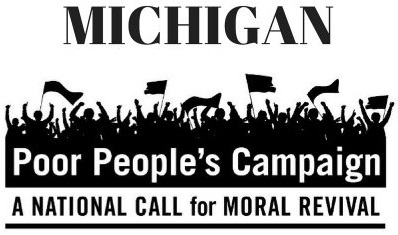 Saturday, January 26, 2019: 9:00 a.m. – 4:00 p.m.
By listening to each other, we hope to create a common agenda for the Poor People’s campaign in our county by identifying and prioritizing strategic actions that can remove the barriers that keep people trapped in systemic poverty. These priorities will come out of our workshop discussions on: Housing, Health Care and Disability, Immigration, Policing, Criminal Justice, Veterans’ Concerns, Employment & Wages, K-12 Education, Environmental Justice, and LGBTQ Justice. Come together to remember the 30,000+ lost each year and to work for hope, peace, and love in their honor. This year marks the 6th anniversary of the heartbreaking Sandy Hook Elementary School massacre in Newtown, CT. Since then, 500,000 Americans have been killed or injured by guns. Gun violence impacts all communities; victims, survivors, and families are often forgotten. 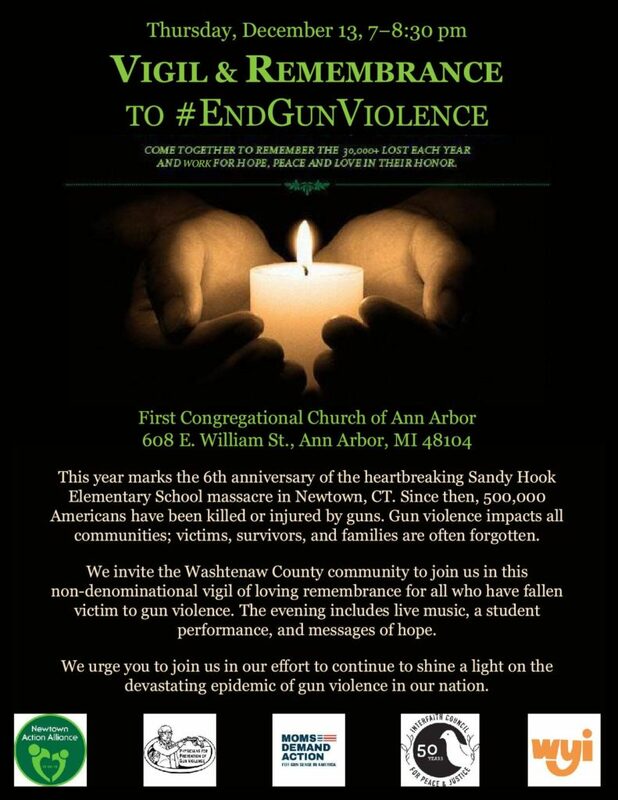 non-denominational vigil of loving remembrance for all who have fallen victim to gun violence. The evening includes live music, a student performance, and messages of hope. We urge you to join us in our effort to continue to shine a light on the devastating epidemic of gun violence in our nation. Mohamed Soumah, a 44-year-old man from the West African former French colony of Guinea-Conakry who has been threatened by Immigration and Customs Enforcement (ICE) with immediate deportation, has taken sanctuary in Ann Arbor Friends Meeting House (Quakers). Mohamed, who has been living and working in the United States for fifteen years, suffers from a serious, life-threatening disease that requires ongoing medical attention. According to his physician, he is essentially on life support. His home country lacks adequate facilities for this kind of care, so returning there would be a death sentence. His mother, who suffered the same hereditary condition, died there due to inadequate treatment. The average per capita income in Guinea is $825/year, and average life expectancy is 52 years. The United Nations Development Program ranks Guinea 175th of 189 countries included in the Human Development Index rankings. Volunteer to provide support: A volunteer training will take place on Sunday, November 11 at 1pm at the Ann Arbor Friends Meeting, 1420 Hill Street. Our hearts are broken by the news of the mass shooting at Tree of Life Synagogue in Pittsburgh earlier today. Our thoughts and prayers go to those affected by this hate crime: the families who have lost loved ones, the broader Jewish community who feels a renewed fear of the continued threat of anti-Semetic violence, and members of other communities targetted by hate groups who see in this attack a reminder of their own vulnerability. The shooter, Robert D. Bowers pursued unjust ends through unjust means. His white Christian nationalist ideology led him to seek a country that put members of his community above others. He pursued this unjust end through demonization and violence. This crime follows just days after the series of pipe bomb attacks on Democratic lawmakers and their supporters and ricin-laden to the President. This series of attacks reminds us that demonization and hate speech have consequences. “Justice, justice shall you pursue.” These crimes call us again to rededicate ourselves to the just ends: a society of inclusion and equity for all faiths, ethnicities, and genders. These crimes also call us pursue these goals through just means–coragously challenging the idoelogies of bigotry and supremecism while avoiding the seductive traps of demonization and violence. As I write this the death toll stands at 11. May their memories be a blessing. May their families find comfort. And may we all join together in the just pursuit of a world of inclusion through just means. Leaders of Color, would you like to attend the Facing Race conference in Detroit this fall? This is your chance! Apply today! 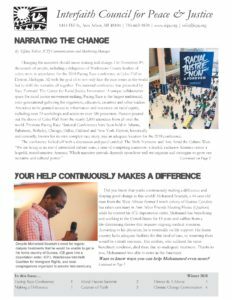 NEW & Interfaith Council for Peace and Justice are excited to announce scholarship opportunities for leaders of color in Washtenaw County to attend the Facing Race 2018 conference in Detroit, Nov 8 – 10th. Facing Race is a national conference presented by Race Forward: The Center for Racial Justice Innovation. A unique collaborative space for racial justice movement making, Facing Race is the largest multiracial, inter-generational gathering of organizers, educators, creatives and other leaders. Facing Race will offer unprecedented access to information and resources on racial equity from across the nation. 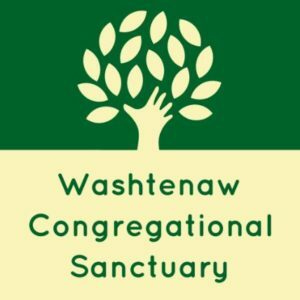 NOTE: Separate scholarship funds may be available for K-12 educators in Washtenaw County schools. Contact [email protected] for details.